What better way to end summer than getting your feet all soft and smooth, right? I am glad that I discovered Baby Foot - a product of Japan, now in the Philippines. It's been a month since I have used this product and I can attest that it removed hard skin on my feet with its gentle fruit acid and seventeen (17) types of natural extracts that have a high level of moisturizing power. I am now a certified Baby Foot(aholic)! *Each pack is good for one time use only. Once opened, you must use the product immediately. 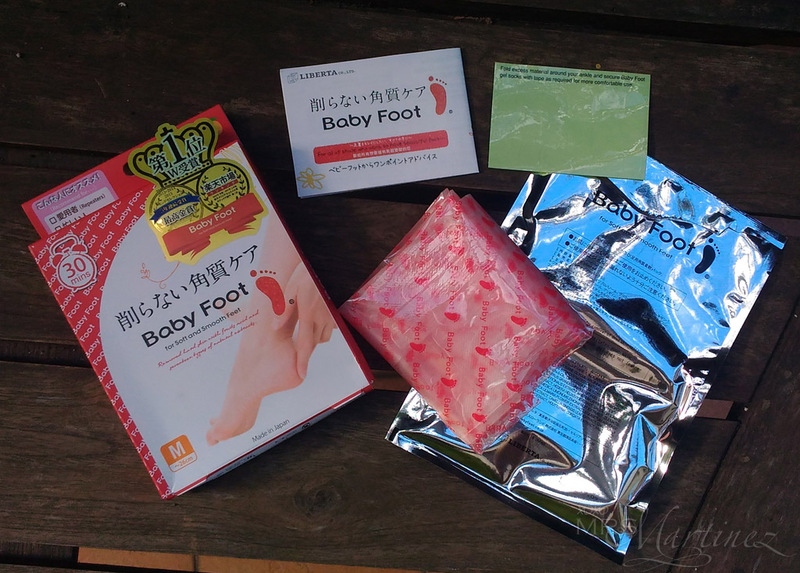 Since its conception in 1997, Baby Foot has undergone 7 enhancements. With the new Baby Foot's 3D boot-shape foot pack, there's better product penetration of the gel-like product. Not only that, walking is more comfortable especially if socks were worn over the foot packs. 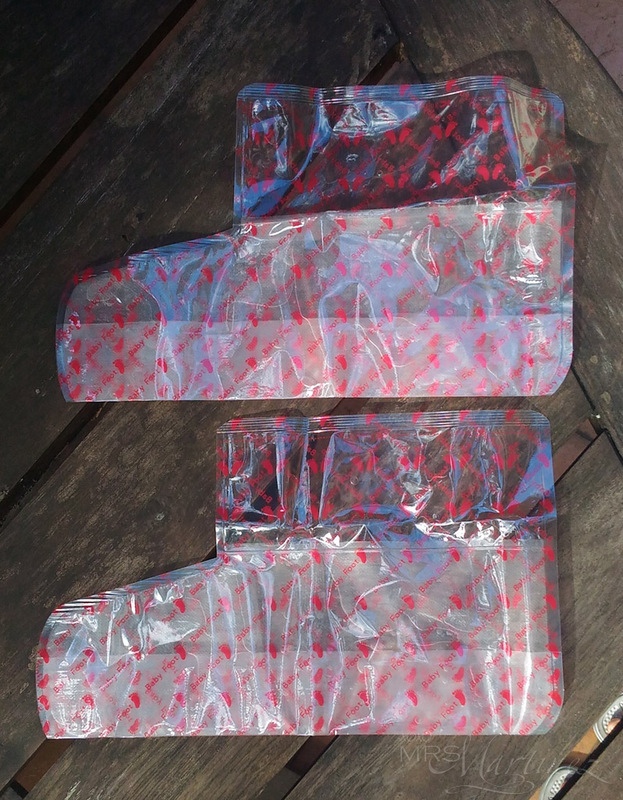 Plus, the packaging is tough enough and tear-resistance, you can be assured that there's no leakage as you are using it. Yes, thirty (30) minutes... that's all the time you need to have soft and smooth feet! NO need for pumice, foot scrub, etc. Apply a small amount of Baby Foot product to the soft part of the sole (arch) with a cotton swab. Wash the area gently with soap and air dry. 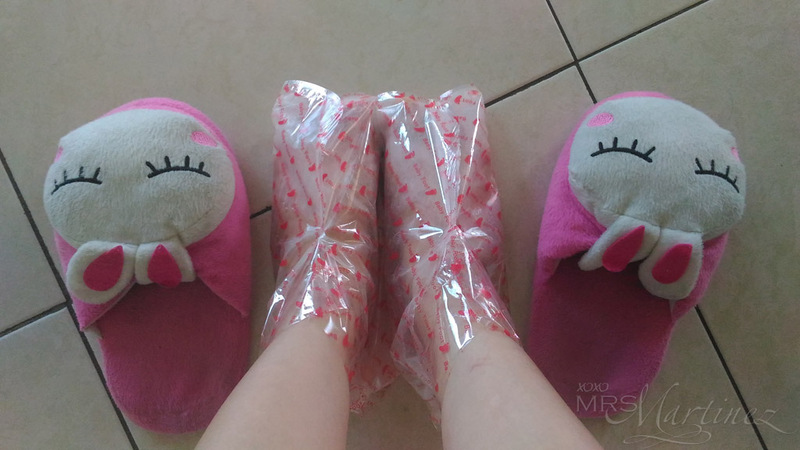 WEAR foot packs after bath for better result. SOAK your foot in the gel pack for 30 minutes for better absorption. 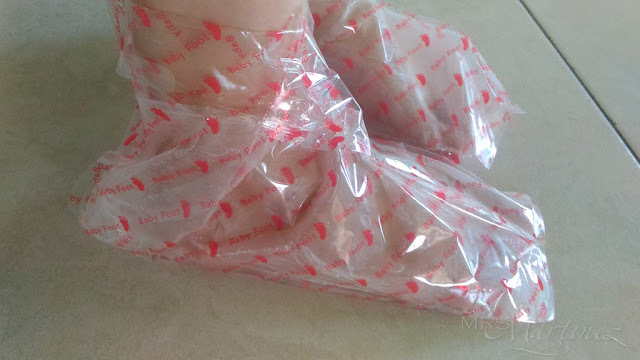 *Use adhesive tapes to secure the foot packs to your feet. *It is highly recommended to apply moisturizer after washing. Once opened, I caught a whiff of alcohol, hmmm... I think more like acetone. After 30 minutes of using the product, I immediately went to the bathroom and rinse my feet thoroughly. My feet felt a slight tingling sensation and were a bit reddish right after rinsing Baby Foot product. It must have been the gel product penetrating my feet. Anyway, I applied petroleum jelly to soothe it. 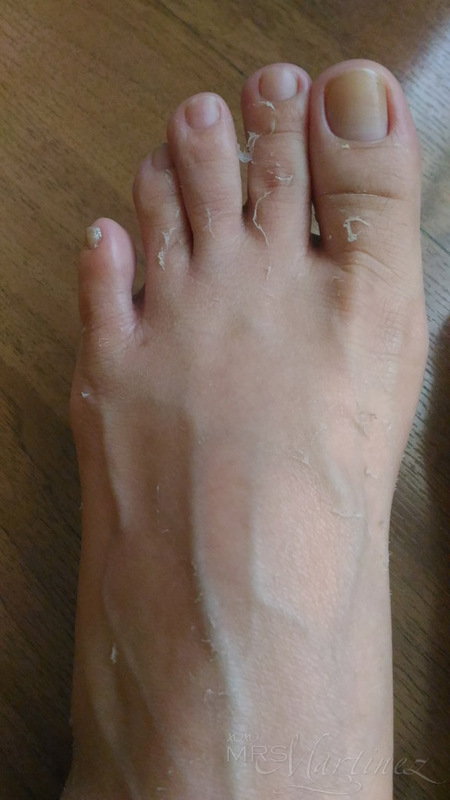 My foot started peeling on Day 4. The peeling started around the edges around my foot. I can't wait to see more peeling... tee hee! It started to get scaly on Week 1. The scaling progressed till Week 2. By Week 2, it was ZURUMUKE level!!! It was terrible because it was itchy! I have to control myself from peeling all the dead skin ; p I have a callus on my big toe (see photo) and Baby Foot took it all out in one peeling session! 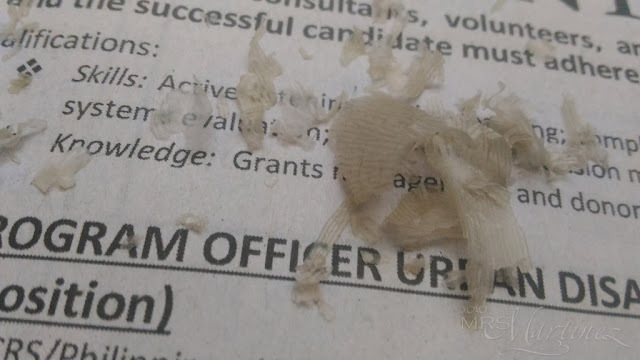 My peeled skin was all over! My feet... reborn! That's how I felt upon seeing how good it looked when I took the photo above ; ) The result may vary for each individual. If you feel that reapplication is necessary, wait for four (4) weeks before using Baby Foot once again. Otherwise, the recommended usage is once every three (3) months or four (4) times a year. Baby Foot retails for only Php 830. It is available in two (2) sizes - Medium (up to size US10) and Large (up to size US13). Baby Foot is exclusively available in all Beauty Bar branches. For more information about the product, follow Baby Foot PH on Facebook, Twitter and Instagram.